Xolo Launched New Xolo Q2500. Xolo Q2500 runs on Android OS, v4.2 (Jelly Bean). The Q2500 has Quad-core 1.3 GHz processor and 1GB RAM. 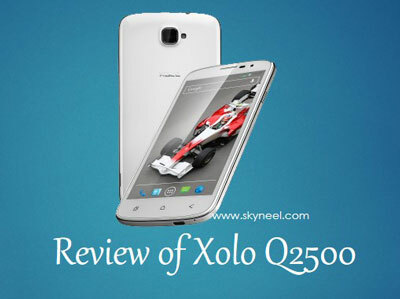 XOLO Q2500 design is slim so it looks very attractive handset. Its feature is very good and attract to the person due to its design and look. On the top is has a Micro USB port with 3.5mm audio jack. On left side are volume keys and in right side it have a power button. XOLO Q2500 is a large and very attractive Smartphone which have slim designed. It has a Micro USB port and 3.5mm audio jack at the top side, volume buttons in the left side and the power button on the right side on the body of the phone. When you connect this phone for charging its battery it shows LED in red color that means your charging process is ON. Xolo Q2500 Powered by 1.3 GHz Quad-core processor With Mali-400MP2 GPU. It has Mediatek MT6582 Chipset. Xolo Q2500has 1GB RAM With 4 GB ROM and user can be expanded memory up to 32GB via SD Card. Xolo Q2500 comes with 6.0-inch IPS LCD capacitive touchscreen with 720 x 1280 pixels Resolution. It has 8 MP Rear Camera with 3264 x 2448 pixels, Auto-focus, Geo-tagging, panorama, face detection and LED flash with 2MP front facing Camera. The Q2500 smartphone is a stylish phone, it has 136 x 64.6 x 8.9 mm Dimension. The Q2500 smartphone runs 4.2 (Jelly Bean) and upgradable to v4.4.2 (KitKat).The Smartphone has a Accelerometer, proximity and Maps, Calendar, Google Search, Gmail, YouTube, Google Talk, Alarm, Calculator, Clock, and other Google sync apps. This is power pack with loaded lots of features and apps. The Q2500 smartphone has 2G and 3G network in GSM phone.It has Wi-Fi, Bluetooth, GPRS and EGPRS or EDGE, and 3000mAh Li-po battery. 1. The Q2500 smartphone has good processor and RAM. 2. It has Latest Android OS, v4.2 (Jelly Bean). 3. It has Accelerometer, gyro and proximity. 1. Xolo Q2500 Doesn’t have 4G network.